Preparation time: 10 minutes. Cooking time: 30 minutes to cook chicken. Cut chicken into bite-size cubes and set aside. 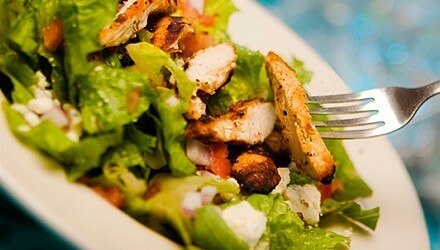 Place 1 cup torn iceberg lettuce on each of four salad plates. Quarter each tomato and place quarters around each plate, or place 6 grape tomatoes on each plate. Distribute cucumber slices evenly between tomato slices on each plate. Top with grated carrots (1/4 cup per plate) and chicken. Trim the roots and 2 inches from the tops of the green onions. In a blender or food processor, combine all dressing ingredients and blend thoroughly until well mixed. Pour approximately 1/4 cup dressing over each salad. Top with cilantro if desired. Serving size: 1 breast on 1 1/2 cups salad. Exchanges per serving: 1 starch, 3 lean meat, 1 fat. Carbohydrate choices: 1. Kathleen Stanley is a Diabetes Educator at Central Baptist Hospital in Lexington, Kentucky.